Vietnam is a long, narrow country occupying the entire eastern and southern coastline of Indochina. The conquest of Vietnam by France began in 1858 and was completed by 1884. It became part of French Indochina in 1887. Vietnam declared independence after World War II, but France continued to rule until its 1954 defeat by Communist forces under Ho Chi Minh. Vietnam is a densely populated developing country that in the last 30 years has had to recover from the ravages of war, the loss of financial support from the old Soviet Bloc, and the rigidities of a centrally-planned economy. The estimated population July 2012 was 91.5 million. There is a 94% literacy rate and10.6% live below the poverty line. 52.48% of the population are Buddhist; 1.8% are evangelical Christians. There are 114 people groups, 56% of which are unreached. 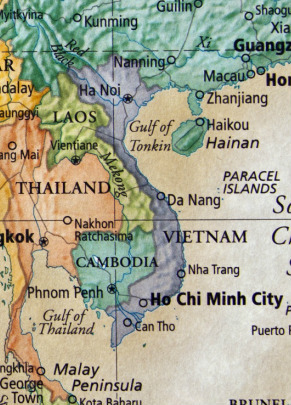 There is an increased number of Biblesin Vietnamese and major tribal languages that are printed and released with permission from the government. This is a great need, as the Church has spread rapidly and has a shortage of Bibles in the heart languages of Vietnam’s peoples. Many Christian books and study materials have recently been published, some by the government’s own publishing company. The deepest spiritual allegiance of the Vietnamese is not to Communism, nor to the mix of Buddhism, Taoism, and Confucianism that is traditionally practiced. It is the veneration and worship of ancestors that runs deepest and across most religious practices. Christians face hard questions in dealing with this issue biblically. In spite of this challenge, a growing, witnessing church is emerging from years of persecution. A significant turning to God is occurring in different places, in both registered and unregistered churches, and among different people groups. The Vietnamese diaspora is also seeing many become believers. These converts then bring the gospel back to Vietnam with them.